Scuffs are very noticeable on bright and shiny patent leather shoes, purses, and other items. This is a guide about removing scuffs on patent leather. To clean scuff marks off white patent leather shoes, rub a small amount of mineral oil onto a test area. If the oil doesn't alter the color of the shoe, take a clean, soft cloth and apply a small amount of mineral oil to the surface of the show. Gently rub the scuff mark with light pressure until it completely disappears. Take a fresh cloth and buff your shoes. If you don't have mineral oil, you can try some petroleum jelly, acetone free nail polish remover, or vegetable oil. 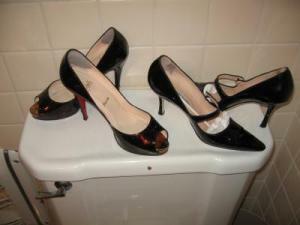 Other options that may work to clean some types of patent leather are toothpaste and shaving cream. 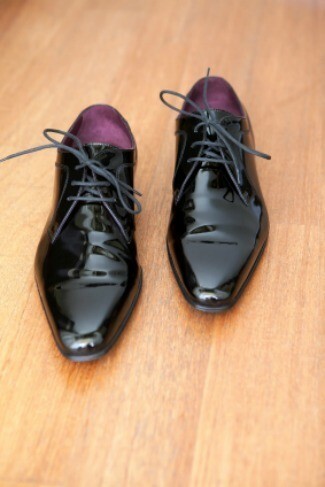 There are so many types of patent leather that what may work for one type of leather may not work for another. You may need to try a few different options. Question: How Can I Remove Scuffs on Patent Leather Shoes? I have a pair of patent leather shoes, that of course now have a very noticeable scuff mark on them. (It seems like the first time you wear a pair, the same thing happens)! 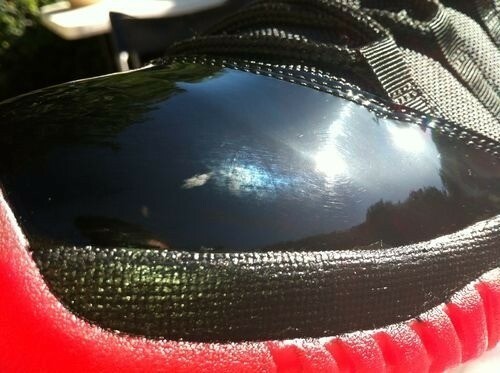 I've heard that there's something that will "erase" these awful scuffs and bring the patent leather back to new again. Of course, I can't remember what the item or product is called. Does anyone have any idea what works, or what I could be referring to? When I was a kid, everybody used Vaseline (petroleum jelly) on their black patent leather shoes, and I did the same on my girls when they were little. Use a cotton ball or Q-tip and non-acetone polish remover. Saturate your cotton and rub until the scuff disappears. Note: Don't let the polish remover sit on the surface for too long as it may compromise the leather. Then wipe the shoe with a damp cloth and dry. If you want, you can then use a small amount of Vaseline to polish and shine the shoe. Hope this helps. I have Patent leather Pradas and the leather is scraped off; is there a way I can get them fixed? Scuff marks steal the luster from leather shoes. An errant step, a clumsy dance partner or contact with a sharp or abrasive object is all it takes to leave your shoes looking scraped and blemished. But scuffed leather shoes are not necessarily lost. Minor scuffs and even some major ones can be buffed out and covered up. Knowing how to remove scuffs can save you the cost of new shoes and the trouble of finding a comparable pair. Step 1Bring your shoes when you buy the refinishing spray; you'll need them to ensure the spray matches the color of the leather. Step 2Wash the spot you wish to refinish. In a well-ventilated area, use a light shoe-cleaning cloth and leather preparer. Allow the shoes to dry, and repeat until the shoe's finish is dull and even. Step 3Cover the shoe in masking tape, except for the scuffed areas. Step 4Spray the shoe evenly across the leather. Allow it to dry and repeat until the spot has a consistent color. Step 5Remove the masking tape and polish the shoes. Step 1Rub the scuff with a microfiber cloth, terry cloth or gum eraser. These can remove mild scuffs. Step 2Use alcohol for more stubborn scuffs. Dip a cotton swab in rubbing alcohol and dab the scuff. Step 3Wipe the shoe with an absorbent cloth. Hi, I have a pair of beautiful black patent leather Mary Jane's, that unfortunately, now have noticeable white scuff marks on then. Anyone have any tips on how to get rid of these, without ruining the shine of the shoes? Can I even get rid of the white scuff marks? I used the advice on this website for removing black scuff marks from my yellow patent leather shoes with nail polish remover, and it worked instantly. HI Everybody! I bought a pair of RED PATENT LEATHER WEDGES from Macy's and was very happy with the product, however was not very happy when I got a HUGE BLACK SCUFF on them! I was so mad!! Then I went online to this site and tried Petroleum Jelly and Acetone like you guys said...the Jelly took it out a very tiny, tiny bit. The Acetone worked awesome though! This really does work! It saved a pair of gray patent leather shoes that I only wore about 5 times! I thought they were ready 4 the garbage with the big scuff marks they had. However, they came off completely with some nail polish remover and a soft amount of scrubbing! AMAZING! I used Vaseline and it worked a treat on my brand new black mary janes. Thanks so much for the great advice! Third: I had cracks in the leather of my shoes, so I improvised and used a little French manicure pen to fill in the cracks. Fourth: a buff shine with jelly. They pretty much look as good as new now! OMG! I love you all! I have a ton of heels that I was about to drop off at goodwill but I thought I would just take a look online to see if there was something I could do to save them and I now love nail polish remover! lol! I used the non acetone and it worked GREAT! Well, trust your mother. Mom says "Just use Patent Leather cleaner" - available at the cobbler (Aka: Shoe repair store). We didn't have any but we had some water proofer - she said that it looks like the same contents, just use a dab on a cotton swab, and then wipe clean with a warm cloth...and Sure as heck, it works perfectly! In the past when I have used non-acetone nail polish remover, it removed shine from the patent. If you leave it on too long, it will do that. I actually read this a magazine today, and tried it on my favorite shoes. All I did was use a sheet of paper towel and some hand sanitizer. It actually fixed the finish in the places where it appeared to be scuffed off completely.